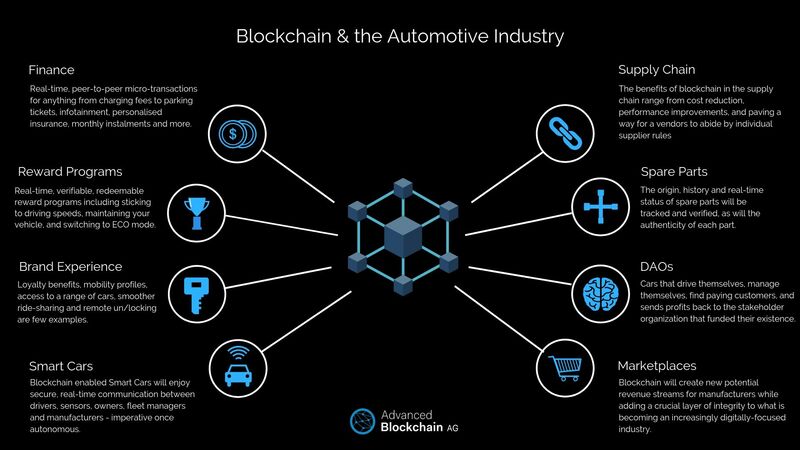 How will blockchain technology disrupt the Automotive Industry? Eight more reasons your car won’t need you in the near future. Over recent years we’ve been peppered with news and articles telling us our vehicles will soon have minds of their own. We’re not quite there yet, but we are inching ever closer. AI & Machine Learning are transforming the automotive industry on all fronts. They’re re-shaping automotive business models, creating new markets, and changing the way we think about our vehicles on the most fundamental levels. So where does blockchain fit into it all? Blockchain is the first form of ledger (a record of anything of value) to do away with the need for middlemen. It makes it possible for ledgers to be distributed to everyone using it, putting the responsibility to maintain their validity and reliability in the hands of the user, rather than a central, corruptible, hackable authority. The result is a system of data registry in which transactions are fast, transparent, reliable and incorruptible. If you’d like to learn more about blockchain before exploring how it could re-shape industries, you can read more about it here. In this series we’ll be examining what impact blockchain could have on the ever-evolving automotive ecosystem. How a technology originally designed to underpin the digital currency Bitcoin, can help us re-imagine the vehicles of tomorrow, and the processes involved in creating them. Ever got into the good driver, bad driver debate? What if that could be verifiably tracked? Better still, what if you could be rewarded for being a good driver? (For the last few years that you need to drive at all, that is). Redeemable reward programs could include sticking to decent driving speeds, keeping your vehicle in good shape, and switching to ECO mode. Just about any financial transaction in the automotive world is about to get a blockchain makeover. The ability to conduct real-time, peer-to-peer micro-transactions means that everything from charging fees, to parking tickets, infotainment, personalised insurance and monthly instalments on your new car, will be made automatic and perfectly accurate. Supply chains stretch across multiple individuals, organisations and jurisdictions. Getting the right materials and moulding them into the cars we see in showrooms is a painstakingly long and detailed process — but it may about to get a great deal more efficient, and a lot more ethical. The origin and progression of spare parts through supply chains can be tracked and verified using blockchain. Manufacturers will have entire histories of car parts, making it possible to tell what’s real and what’s fake with ease, strengthening brands and lowering warranty costs in the process. You might imagine that car manufacturers make most of their money through car sales — and that’s perfectly logical. But in the digital age, they’ve got far more options by which to make a buck. Blockchain will create new potential revenue streams for manufacturers while adding a crucial layer of integrity to what is becoming an increasingly digitally-focused industry. Blockchain could grant users temporary access to a range of cars and facilitate autonomous ride sharing. Even the more basic elements such as locking and unlocking your car will be faster and safer, as will remote unlocking, in case you’re expecting a delivery while you’re out. Blockchain is set to amplify the already huge expectations we have for the self-driven, autonomously navigated, drink-and-driverless world of tomorrow, making the once human interactions between vehicles and their environments seamless and instantly available to the constantly communicating fleet of spaceships. Co-Author of Das Krypto-Jahrzehnt. Head of Marketing at Advanced Blockchain AG. Fascinated by Distributed Ledger Technology and its potential to shape our collective future. Imagine if we could verifiably track how well people drive and reward them for good practices.